See picture sold as seen. KAIR STRAIGHT 150MM TO 100MM ROUND DUCTING REDUCER / ADAPTOR Summary: Kair 150mm female to 100mm male round ducting adaptor. Male fittings such as connectors, bends, and grilles will fit straight in to the socket. This is a square to round adaptor for our industrial centrifugal blower on sale. The hole centres match up perfectly and bolts will be provided with the unit. Look up QT240 for the correct size. R12 - R134a Conversion. R134a Set Up Kits. Elke R134a Car A/C Air Conditioning Refrigerant Pag Iso 46 Oil. OFN (Oxygen Free Nitrogen). Compressor Service Tools. Leak Fixing. Oils Vacuum. Oil / UV Dye Injectors. daikin Brc1h519w Remote Controller. Condition is New. KAIR SYSTEM 100 ROUND CONNECTOR WITH BACKDRAUGHT SHUTTER / DAMPER Inline back draught ducting damper / shutter for 100mm round ducting system. There is a lip on side to inset into standard 100mm ducting Male Spigot will fit inside Kair 100mm Round Pipe (Part: "DUCVKC250") or 102mm Flexible Hose (Part: "DUCP0092/102/35") and can be used to join multiple lengths of pipe together to form a long duct run. Integral cold conductor (PTC). To protect the motors from overheating the KBR fans have Integral cold conductor (PTC) with external leads for connection to a motor protection device. The KBR fans have a swing-out door for easy inspection and service. Aspen Pumps Peristaltic Spare Tube Kit FP1282 Inspect pump head regularly and change the pump head tube every 12 months or more frequently if required If any problems with the pump occur check the tube first! To remove pump head make sure the roller assembly is vertical. Remove transparent cover and fit replacement pipe. The addition of a smear of silicon grease will ease the refitting of the lid, reducing potential friction noise.This only takes 3 minutes! AIRREX HSC 2500. Air Conditioner. LV88 – Rytons 9×3 Louvre Ventilator - BrownPlastic louvre grille. Size: 271mm L x 95mm H. Free Area: 8800mm² (88cm²) per unit. Room and cupboard ventilator. Low profile fixed open louvres allow a high air flow. Embossed with DO NOT BLOCK. Compatible with Rytons 9×3 AirLiners®. For internal and external use. U.V. stabilised to slow down the effects of sunlight. BBA approved – your independent assurance that the product meets building regulations and standards and will last. New listingIris 125mm Volume Control Damper Manual BNIB! 150mm Ducting Pipe 90 Degree Elbow. 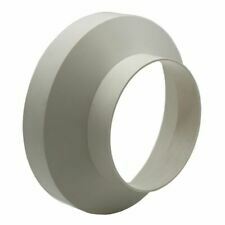 Connector fits into Ø150mm round pipe ducting to connect two lengths together in a 90-degree elbow. Colour: White. Quick and easy fit. Trip Point A/MCS - Fixed @ below 0.20 A. Aperture (Hole) Size A/MCS - 0.55” dia., up to 1 AWG cables. A/MSCS - Fixed @ below 0.55 A. Part Number: A/MCS. A/MSCS - 0.53” dia., up to 1 AWG cables. A/MSCS: 0.5A Continuous 36 VAC/VDC. 5W Shaded Pole fan motor complete with ring mount and fan blade included. BLOWER - pulls the air from over the motor and blows out from the fan. Blade pitch 22. These are genuine EMI ring mount assemblies. 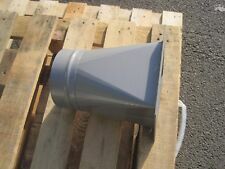 400mm/16in Plate Mounted Axial Fan 3phase 4pole Blowing. Cheques must be drawn on a UK bank account. Lever & Wood have been providing quality fans and motors to the industry for 12 years. We have an extensive catalogue of products allowing us to match and replace many other manufacturers fand and motors. Looking for a clip for rigid pipe?. Why not take a look at our 150mm pipe clip (Part: "DUCVKC442C"). Made in the UK. Compatible with the extensive Kair SYS-150 range of fittings, outlets, and grilles. 1/4 X 0.028 Hvac Copper Refrigeration/ Aircon Tube X 30 Metre Coil. Condition is New. Dispatched with Royal Mail 2nd Class Large Letter. 2 lengths of New 630mm spiral ducting. 1x 3m 1x 1.8m surplus to requirements. COLLECTION ONLY. Gloucester. WASTE OIL BURNER / HEATER. IF YOU ARE AFTER AN OIL BURNER THESE ARE THE PLANS FOR YOU. COMPLETE STEP-BY-STEP SELF BUILD PLANS. Self-Build Plans. & is not an actual shot of the plans. I HAVE NEVER TRIED TO BUILD ONE OF THESE. SUITABLE FOR MOST SINGLE PHASE 240 VOLT FANS. Approved for R410A refrigerant. Compatible with any standard SAE refrigerant hose. Red blue: 1/4" male SAE on one end and 5/16" female SAE with valve core depressor on other end. Yellow: 1/4" male SAE on one end and 1/4" female SAE with valve core depressor on other end. Turbine Blower Cooler Cooling Fan. Size 75 x 75x 30mm / 3" x 3" x 1.18" (L W H). Help push the hot air out of your computer when mounted on the back or draw in fresh air if you mount it at the front of the case. Kair System 204 Airbrick with Surround - Fits 204mm x 60mm Ducting - SYS-204 - DUCVKC5635These Kair System 204 Airbricks with Surround provide a simple option for ventilation installation in brick walls and can be used with all common ventilation system. KAIR GRAVITY GRILL 110MM X 54MM RECTANGULAR SPIGOT - WHITE White Coloured Square Plastic Air Inlet / Air Outlet with Gravity Shutters 110mm x 54mm rectangular female spigot on the back of the grille fits over Kair Male 110mm x 54mm Rectangular Duct Pipe (Part: "DUCVKC249"). Explosion Proof Industrial Ventilation Extractor Fan Axial Air Blower and Louvre 400mm 16" 230v 180w - 3480m3/h. Explosion Proof Blowers. This is for the fan and motor assembly with Louvres. Cheques must be drawn on a UK bank account.